Strauss, Walter, and Tracie Felker, editors. Drawings Defined. New York: Abaris Books, 1985. Etheridge, Ken. Collecting Drawings. London: G. Bell and Sons, 1970. Describes “some of the artists most representative of their times” as well as drawing techniques and materials. Includes period chapters on the 18th century, the 19th century, the Neoclassicists, the “animal-lovers,” illustrators, and the 20th century. Also includes chapters on monograms and signatures, buying drawings at auction, prices, how to keep drawings safely, and an index of artists and prices in 1966, 1967, and 1968. Price information is outdated. Goldman, Paul. Looking at Drawings: A Guide to Technical Terms. London: British Museum Publications, 1979. Provides definitions of terms commonly used to describe and discuss drawings. Illustrations provide examples of specific media, techniques, and marks. Mendelowitz, Daniel Marcus. Mendelowitz’s Guide to Drawing, 3rd edition. Revised by Duane A. Wakeham. New York: Holt, Rinehart and Winston, 1982. A systematic introduction to the art of drawing, intended for students of drawing but useful to the collector wishing to understand drawing methods, materials, and subject matter. Includes chapters on art elements (line, value, texture, composition, perspective), media (dry media such as charcoal, chalk, pencil, and crayon, and wet media such as ink, wash drawing, and mixed media), and traditional areas of subject matter (still life, landscape, figure drawing, portraiture). Well illustrated. Thomas Gainsborough. 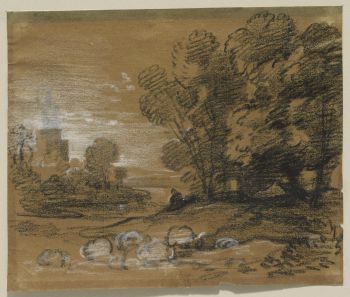 Wooded Landscape with Shepherd and Sheep, Winding River and Tower, mid- to late-1770s. Black and white chalks on brown laid paper. Gift of the Manton Art Foundation in memory of Sir Edwin and Lady Manton, Sterling and Francine Clark Art Institute, Williamstown, MA. James McNeill Whistler. 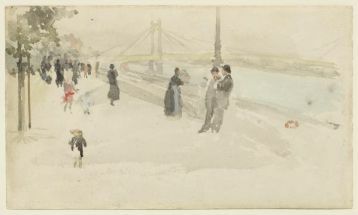 Pink and Silver - Chelsea, the Embankment, 1885. Watercolor on paper. Sterling and Francine Clark Art Institute, Williamstown, MA.